Read the original article by clicking on this photo. If you like the horse for how he is, and who he is, then go ahead and take the plunge. But it’d be a shame if you avoided buying your next best friend because of a problem you thought that he might have, only to watch someone else have a great time with him because they didn’t share those same concerns. Zelda went on trial before my husband bought her for me. The vet who did the PPE said she “might” develop ring bone eventually because she’s a big horse. I am enjoying my time with Zelda because when she went on trial (while I was riding her for my friend who owned her), the vet said that while she had no problems now, she could potentially develop ringbone because she’s a large horse. Yes, she’s a big girl, but I’m not going to worry about it just yet. I’m having too much fun. I’d like to add a couple of additional rules based on my experiences buying horses. I haven’t bought a lot of horses, but I’ve generally had a lot of fun with the ones I’ve brought home. Find a horse that likes the discipline that you enjoy. If you like a specific discipline, don’t just hope the horse will turn out to be suitable. Not every horse is good at every job. I bought a beautiful OTTB mare once who turned out to have zero jumping talent. She hung her knees so badly that my trainer advised me to not jump anything solid if I was alone! I sold her to a non jumping home! As a foxhunter, I will only buy a horse that I know likes to hunt. Life is too short to convince one that doesn’t enjoy the speed, the excitement and the terrain. I’ve seen several people buy horses that didn’t like hunting and it’s just not fun. Don’t spend more than you can afford to lose. A wise trainer told me this, right after she explained that the horse that was “perfect” today could become a pasture ornament tomorrow. Get the opinion of a trusted friend or expert. It’s easy to fall in love with a horse when you are looking to buy. You project on this animal your hopes, your dreams and your romantic ideas of what you think you can accomplish. Always bring a trainer, a friend with a good eye, or a vet to make sure you remove the rose colored glasses before you spend the money. You need to buy the right horse for YOU. Which is not always the horse you imagine riding off into the sunset. Don’t skip the pre-purchase exam. While it’s not necessary to x-ray a horse until it glows, getting a baseline evaluation of a horse’s health and suitability is important. As I said above, a horse doesn’t generally pass or fail a PPE, and it is only a snapshot in time. But an exam can help you understand a horse’s limitations or maintenance needs, and then you can make an educated decision about purchasing him. Very few horses are perfect, but you should have a clear idea of what you are getting into as an owner. Freedom, for instance, was retired from racing due to an apical sesamoid fracture and a “mild” suspensory injury. He made a full recovery from those injuries and they have never bothered him since. But it was something I needed to know about and evaluate to make sure he was suitable to be a hunt horse because that’s what I like to do. Find a vet you trust, who understands your needs. Horses do not pass or fail a pre-purchase exam, but a vet who has done a lot of them, has a pretty fair idea of how well a horse will stand up to the job you want to do and can advise you accordingly. I had a horse vetted once in Ohio. It was a nice horse, but the films revealed an old fracture to the coffin bone that hadn’t healed quite right. I wanted a horse to event. My vet that while I could make up my own mind, if I were his daughter he’d tell me to pass because a bad step out on uneven ground might refracture the bone and be dangerous for me and the horse. For another job, the horse would have been fine. When I found the horse I ultimately bought, the same vet told me to buy him unless it meant eating peanut butter and jelly for the next four months. That horse was Kroni and I had him for a bit more than 12 years. What are your rules for buying a horse? Do not judge by my first impression. For some reason, I tend to make (unfair, and usually untrue) snap judgements about what the horse is like. If I had gone with my first impressions, I would have missed out on the best horse of my life, and many other fine horses I’ve been lucky enough to have shared with me. I love love love the rule: “make sure the horse likes what you like to do”. I bought a cow horse who was an incredible dressage ride. He did it with good grace. I later understood he hated it. It all worked out for us. But if I’d been a die hard DQ, we would both have been unhappy. I got someone to teach me roping moves (without the rope or cow!) and we practiced those as well, which made him very happy. So many people don’t understand that horses have a choice what they do. You do have the good “all rounders” but some horses have a marked preference for one discipline or another and they make their opinions KNOWN. When I figured out that Kroni loved to foxhunt, I realized that I had a much happier, more fun horse to ride. I had my doubts that Freedom would become a hunt horse, but once he figured it out, he loves it too. However, I’ve got friends who found their horses never really liked to hunt . . . so if you love a discipline it’s better to find a horse that can already do that job. 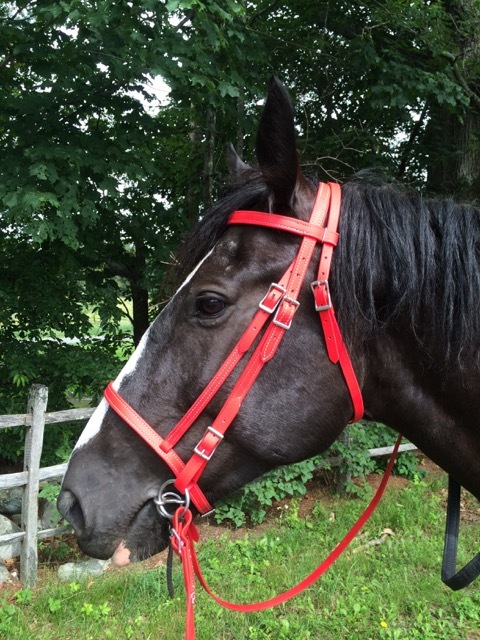 This post is extremely timely as I have been helping a friend shop for a horse. Thanks for the putting this out there!